운주사에는 통일신라 후기의 승려 도선국사가 우리나라의 지형을 배로 보아배 한복판에 해당하는 호남 땅이 영남 땅보다 산이 적어 배가 한쪽으로 기울 것을 염려하여 1000개의 불상과 1000개의 탑을 하루낮 하루밤 사이에 도력으로 만들었다는 전설이 내려오고 있다. 현재 절에는 탑 18기, 불상 70구가 남아 있는데, 화순 운주사 석조불감(보물 제797호) 앞에 자리잡은 이 탑도 그 가운데 하나이다. 탑의 구성이나 전체적인 형태에서 일반적인 석탑의 형태를 따르지 않은 특이한 모양의 석탑으로 고려 석탑의 특징을 잘 나타내고 있다. 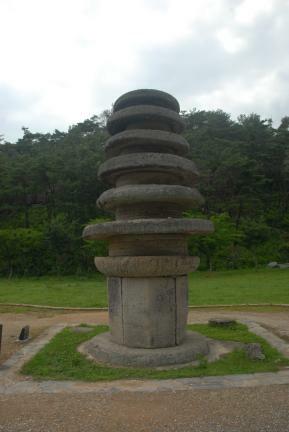 기단(基壇)은 2단의 둥근 바닥돌에 높직한 10각의 돌을 짜올리고 그 위로 16장의 연꽃잎을 장식한 돌을 올려 마무리하였다. 탑신(塔身)은 몸돌과 지붕돌이 모두 원형이고, 층마다 몸돌 측면에 2줄의 선이 돌려져 있다. 현재 남아 있는 것은 6층 뿐이나 원래는 더 있었던 것으로 보인다. 탑의 구성이나 전체적인 조형면에 있어 우리나라에서는 그 예가 드문 모습으로, 고려시대에 이르러 각 지방에서 나타난 특이한 양식이라 하겠다. 기단의 맨윗돌이 윗면이 편평하고 옆면이 둥근데 비해, 탑신의 지붕돌은 정반대로 아래가 편평하고 윗면이 둥글다. 이는 상하의 조화와 안정감을 꾀하려 한 의도로 추측된다. 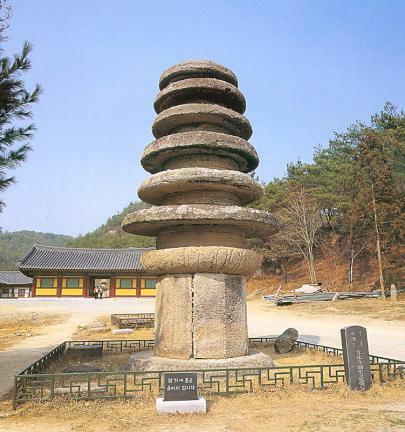 Unjusa Temple embodies the myth that State Preceptor Doseon built 1000 Buddhist statues and 1000 pagodas in Jeolla-do so that the ship of state, symbolizing this country, would not list to port. The monk viewed the land of this country as a ship and was worried that the ship would tip over because there are more mountains than flat land in the Honam area, which was considered as the centre of the ship. Currently, there are 18 pagodas and 70 Buddhist statues remaining in the temple. 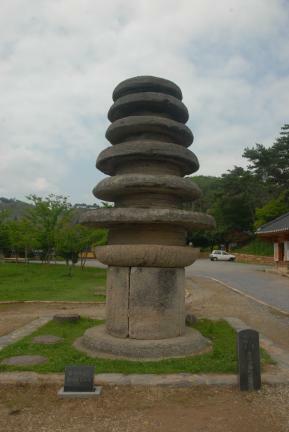 This is one of the pagodas, and it is situated in front of the Shrine of Stone Buddha at Unjusa Temple. 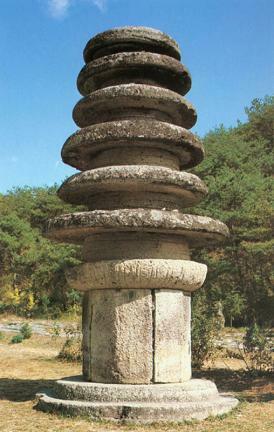 It does not follow the usual form of stone pagoda in its composition and overall appearance, but rather it reflects local characteristics from the Goryeo. 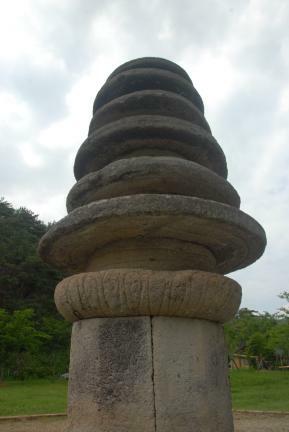 The stylobate consists of two stories of round base stone, a tall middle stone with ten facets, and the upper stone decorated with 16 lotus petals. 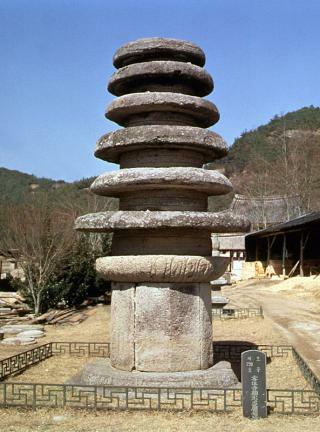 The main part of the pagoda keeps the shape of circle at the body stone and roof stone. 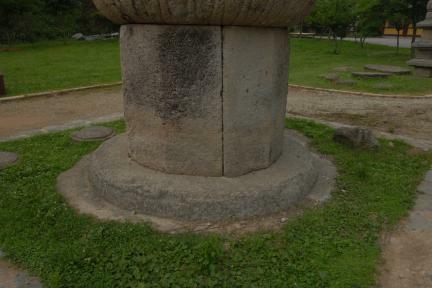 Each story has double lines along the side of the body stone. Although it exists now as a six story construction, the original seems to have had more stories. 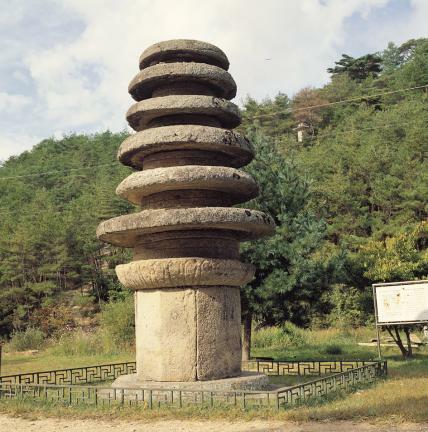 The composition and method of construction of the pagoda make it quite different from others, and reflect the special local characteristics that developed during the Goryeo period. The surface of the upper stylobate is smooth and even and the side round, while the bottom of the roof stone is smooth and even and the surface of it round, showing stability and harmony between the top and the bottom.